Understanding the Task: Before the writer even begins to construct their document, there are a couple of things they need to do. The first thing the writer needs to do is establish the type of document they are creating. There are a variety of different technical documents that can range from something like a user manual to a data sheet. It is important to coordinate with anyone else working on writing the document in order to establish the design, organization, and style. In addition to this, creating a time-table and an organized outline are ways of keeping the project moving and holding writers accountable for producing content. Considering the Audience: Once the formatting and guidelines for the documentation are complete, it is important to understand who the audience is before beginning to transcribe any ideas. Being able to comprehend the background of the reader is critical because it establishes the way the content is written in terms of language, detail, and organization. It is important to know if the audience is technical or not in order for the writer to use appropriate references. Whether the writer is writing for a group of engineers within their company, or for an external group with no technical experience, the different audiences need different levels of detail. Regardless of who the audience is, it is critical to determine what information not to include, what information will confuse readers, and what information will make it difficult for a reader to digest the main points. Writing the Document: When writing a technical document, one of the most important things to consider is the hierarchy of the information being used. Adding levels of hierarchy to categorize information can allow for a very coherent and granular organization system, but over-categorizing information can lead to confusion. Another simple thing that can be done to make important information easier to understand is writing paragraphs in a short and concise manner. The main point of a paragraph should be stated almost immediately so the reader knows if they are looking in the right place. Other beneficial things to do to make a document more user-friendly include reducing the amount of redundancy, providing tables and examples with explanations, avoiding jargon, and using clear sentences. Even though the task of writing can be managed under the right instructions, proper documentation is often something that is neglected among developers and engineers. This is due to the fact that engineers are not natural technical writers. Writing documentation is tedious and requires a lot of attention to detail. Often these developers and engineers are the experts on the technical language and concepts, but being able to translate that knowledge into something that is coherent to someone who doesn’t understand the complexity of the technology can be difficult. The main issue with documentation is that it can go out of date very quickly. Having to constantly update software or hardware documentation can slow down engineers and developers in doing their actual jobs of creating new content. Even though there are negative connotations associated with engineers and their documentation ability, there are potential fixes to these issues. A potential solution can be training engineers how to communicate the simplicity found in complex ideas through technical writing training. In addition to this, having technical writers work with engineers to produce documents and update them can help ease the task of writing documents. The time and cooperation it takes to write great documentation can be very beneficial for a business. Poorly written documentation will deter customers because the information they might need to use a product isn’t easily accessible. If engineers and developers cooperate to make proper documentation, there can be improved sales because the product information is much easier to reference. In addition to this, a well written document can provide adequate training on how to use a product, which will prevent customer errors. A well written document will attract customers and make it much easier to sell products. The CAN protocol (ISO 11898) has remained relatively unchanged since it was introduced in 1993 as CAN 2.0 A/B. In the last few years, CAN FD (for Flexible Data rate or “Fast Data” as we like to call it) was introduced and is now defined as ISO 11898-1. The CAN FD protocol is backward compatible. Any CAN FD device can understand CAN 2.0 frames (now known as “Classic CAN”). However, the opposite is not true. If a Classic CAN node encounters a CAN FD frame, it will destroy the packet with an error frame. Classic CAN has been the de facto standard for in-vehicle communication for the automotive industry since the 90s. CAN has also been used as the lower-layer protocol for a number of other “higher-layer” protocols such as CANopen, J1939, DeviceNet and more. This has resulted in the CAN protocol being widely deployed in factory automation, heavy-duty vehicles and engines, and internal machine communication – such as elevators and medical equipment. The automotive industry is the main driver behind the adaptation of CAN FD. The complexity of software in automobiles has increased over time, and the number of systems that communicate with each other via CAN bus has also increased. Between 1990 and 2000, the number of in-vehicle bus nodes went from about 10 nodes to more than 40 systems. This trend has continued into the 21st century, as in-vehicle communication demands have put further and further strain on vehicle design, causing an ever increasing number of CAN bus networks in the vehicle. Through the adaption of CAN FD, in-vehicle communication architectures will be able to accomplish more with less! 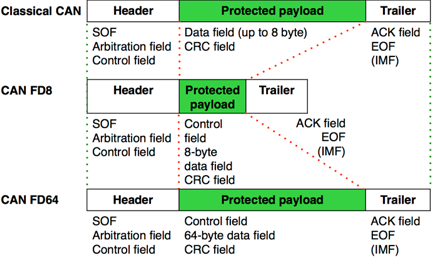 The basic idea of CAN FD is to speed up the bit rate during the “payload” part of a CAN frame. In this way up to 8 times more payload (64 bytes vs. 8 bytes) can be delivered in the same amount of time. So the beginning and end of the frame are transmitted at “Classic CAN” speeds, and the CAN transceivers just flip a switch and speed up for the payload part of the message. When you consider that the rest of the frame is at slower speeds, the overall increase in speed is about 6 times faster. Not all messages need 64 bytes of data of course, so the diagram below shows how a CAN FD message of 8 bits and 64 bytes compare to a Classic CAN frame of 8 bytes. The question is why didn’t CAN FD just speed up the whole message? Why just the payload? The answer requires a slightly deeper understanding of the CAN protocol. A basic element of the CAN protocol is its arbitration process. When two nodes transmit at the same instant, their messages “collide” and they must both “back-off” and retransmit at different intervals according to priority. Another basic element of the protocol is that nodes on a bus must be reached within a “bit time” during this arbitration. The notion of a “bit time” has implications on the length of the bus – the actual cable, since electrical signals have a finite propagation speed. Therefore, a CAN bus running with 1 Mbit/s has a maximum length of 40 meters by rule of thumb. If CAN FD sped up the whole bus, the higher bit rates would shorten the bus cable to unsuitable lengths. The automotive industry is readying itself to start initial implementation of CAN FD in its designs for 2016, with vehicles hitting the market with CAN FD hardware the following year. As this industry ramps up and more and more ECU’s (in-vehicle “Electronic Control Units) and sensors and actuators also adapt CAN FD, more companies with ties to automotive (suppliers, service companies, dealers, OEMs, etc.) will need CAN FD-capable interfaces. Luckily, Peak-System from Germany is one of the first companies to introduce a CAN-FD interface, (PCAN-USB-FD), and it has been fully tested to the standard. Additional hardware and software supporting CAN FD are on the way. Grid Connect has Peak’s CAN FD products in stock now – we are ready for the next big (fast) thing! Grid Connect Inc. has one of the best engineering teams in the world. Our strong development team can quickly and effectively implement your partial or complete networking/cloud-based or embedded product. For more than 20 years we have been helping customers put networking technology into their products. In the past the focus has been Ethernet, serial and propriety networks. Now days, the focus is on wireless networks like Wi-Fi, ZigBee, Bluetooth/BLE and 900 MHz. With the ConnectSense brand of products, we took Grid Connect’s embedded networking expertise and put it to use in the consumer home automation/Internet of Things marketplace. In creating ConnectSense, we built a full end-to-end solution, which incorporated custom hardware, embedded Linux development, a custom cloud solution, and custom enclosures and sensors. Since releasing ConnectSense to the market in 2013, we have continued to move our technology forward. With the ConnectSense Smart Outlet we have made great strides in easy setup and provisioning of devices, smaller and more affordable designs and development of apps for iOS. The ConnectSense Smart Outlet also represents the first generation of devices that are Apple HomeKit-enabled allowing for great features such as Siri voice control, end-to-end encryption and ease of use. The ConnectSense product line allows Grid Connect to prove out its technology at scale and improve it over time. This allows us to then take that same great technology and help customers implement IoT solutions in their own products. Rather than starting from scratch, our customers benefit from our wealth of knowledge developing IoT products. This allows for quick time to market, lower cost implementations and less custom work required on projects. To discuss development partner solutions for your company, please call the Grid Connect office at +1 (800) 975-GRID or fill out the form here. 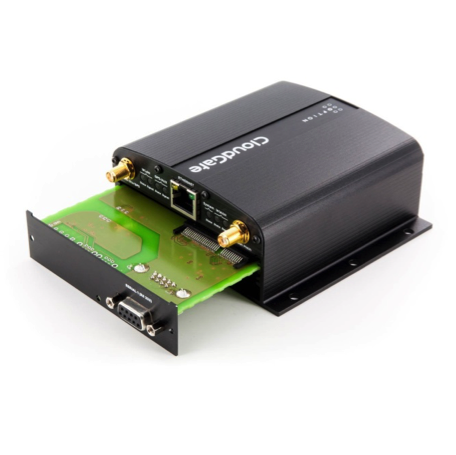 The CloudGate Kits (Serial, Ethernet, WiFi) provided by Grid Connect are comprised of all the CloudGate components required to move local data to the cloud via 3G/LTE cellular data. The CloudGate Gateway provides cost effective Local Area Network (LAN) to Wireless Wide Area Network (WWAN) routing with GPS functionality built in. The CloudGate base unit is a compact, reliable, secure, and flexible solution to move critical data to the cloud. The CloudGate Gateway supports both 3G and 4G LTE wireless data interfaces and is certified on all major US cellular networks. The Gateway is also easy to configure locally or remotely from a PC, tablet or Smartphone. CloudGate automatically resolves common problems associated with wireless machine to machine connectivity. Built-in software and hardware watchdogs continuously monitor each component of the product and its connectivity to home servers. In the event an issue is detected, the product proactively takes steps to re-establish connectivity. All software and configuration images are protected with digital signatures and have dual rollback images that allow the product to revert to previous working settings if an issue is detected. All management functions are protected by certificate and/or password based security mechanisms and all management actions take place over hardware-assisted encrypted links. The CloudGate Gateway is supported by the CloudGate Universe provisioning system. An automated cloud provisioning system means that each CloudGate can be set with its own custom configuration and image that is automatically loaded from the cloud when the unit initially connects to the Internet. For more information, and ordering options visit our website by clicking here. Connecting products to the Internet of Things (IoT) is essential to manufacturers looking to stay competitive within their industry. Adding IoT capabilities gives consumers more features. It also allows the manufacturer to stay connected with their customers while discovering new product use cases and applications that open them up to new revenue streams. The “Internet of Things” (IoT) is a phrase used to describe making everyday objects “smart” by adding networking and connectivity to them. Grid Connect Inc.’s DNA has been IoT from the very beginning. Grid Connect can supply your team with technology, custom engineering, expert knowledge and support at all levels of the IoT pyramid. We provide end-to-end solutions starting with your existing product and ending with a truly smart device. To further illustrate Grid Connect’s knowledge and abilities within the IoT marketplace, consumers can purchase our own product line of IoT-connected devices. ConnectSense is a family of wireless sensors for your home or business. Each sensor uses the Wi-Fi network in your location and communicates to the ConnectSense cloud application. The ConnectSense cloud stores data from your sensors and generates notifications when a rule you have set applies to your environment. For example, if the ConnectSense Water Sensor in your basement detects water, the sensor will communicate this change to the cloud application. From here, the cloud application will then determine what to do with this new information, such as send you a notification so that you can react appropriately. 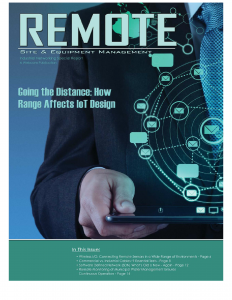 If you are looking to add connectivity to your product, download “10 Internet of Things Design Considerations” and call Grid Connect at +1 (800) 975-GRID or fill out the form here. 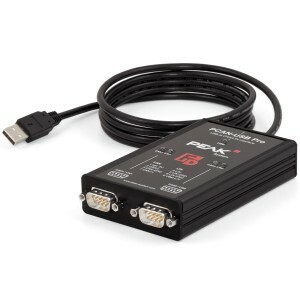 The PCAN-USB-PRO FD adapter connects a USB port to CAN and LIN networks. Two CAN/LIN buses can be connected at the same time, with up to software four connections available using appropriate adapter cables (2 x CAN, 2 x LIN). The CAN USB PRO FD is housed in a robust aluminum casing making the PCAN-USB Pro FD adapter suitable for all types of applications. The CAN USB Pro FD supports the new CAN FD standard and is 100% hardware & software compatible to the original CAN USB Pro adapter. The new PCAN-USB driver version 4 must be used. When it comes to designing products for the burgeoning Internet of Things (IoT) market, there are many development options. Designers must consider choices for hardware and software, Internet connection method and device power, to name a few. When making these decisions, there is often one factor that will influence all these choices: distance. The network range required for IoT devices plays a surprisingly important role even in the smallest design decisions. After all, the transmission of data is at the core of IoT devices. Transmission range depends on the type of network used, the environment it will be used in, and the types of data being communicated. Will the device be used inside one building or between buildings? Will the device need to transmit data through walls or floors? Is transmission impacted by buildings or trees? Will the device connect to a nearby existing network or to a cellular network miles away? Will the device send show tourists of information, such as text messages, or longer information, such as videos or files? Read more at Remote Magazine or download the PDF now.